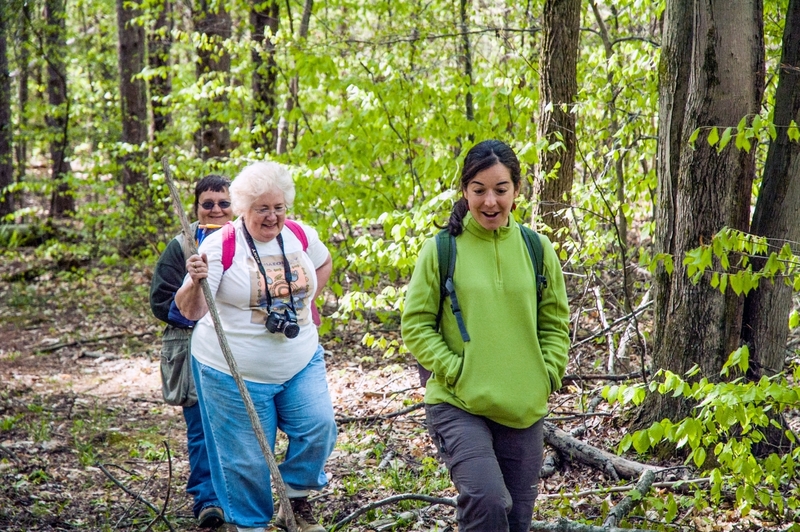 Since Natural Bloomington's first ecotour in May 2013, nearly 100 guests have joined us on nearly a dozen guided treks through the Southern Indiana wilds. Representing a wide diversity of nature lovers, their ranks include born-and-bred Hoosiers; retirees of all stripes -- doctors, professors, lawyers, secretaries; environmental activists, birdwatchers and nature photographers; and college students with an array of ethnic backgrounds, including Chinese, Indian, Syrian and Pakistani. Special guests have included archaeologists, naturalists and a Pulitzer Prize-winning photographer. The pace slowed a bit in 2015 while founder Steven Higgs finished writing his first guidebook -- A Guide to Natural Areas of Southern Indiana -- which will be published in June 2016 by Indiana University Press. He is now re-focused on Natural Bloomington and related projects and planning to expand the number and diversity of our guests even more in 2015. Custom ecotours of any length and focus can be arranged for groups of 3 to 15. If your group or organization has specific interests -- i.e. old-growth forests, Karst topography, surface or underground water, public lands, etc. -- we can arrange just the trip for you. Natural Bloomington ecotours can be scheduled for any day of the week. The number of destinations and ecotour routes is limited only by time and imagination. Custom ecotours can be arranged upon request. For Logistics and Rates, scroll down this page. 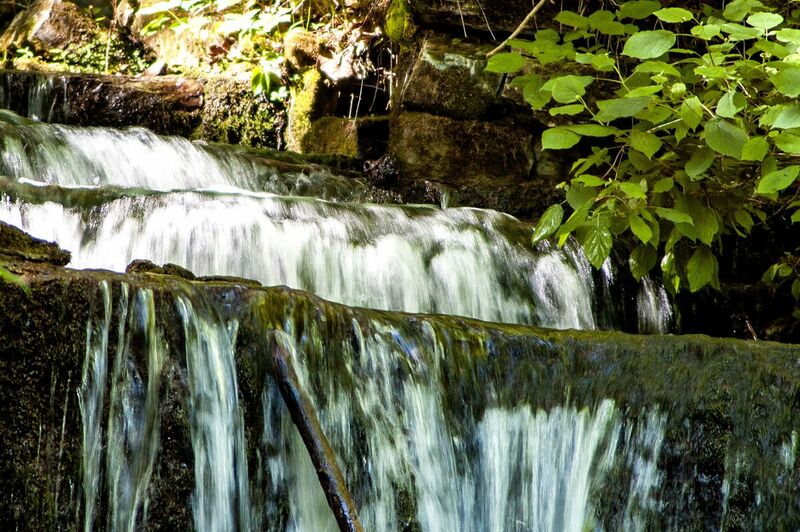 Natural Bloomington's Steven Higgs will lead members of Heartlands Group Sierra Club on this two-leg hike through the Hoosier National Forest. The morning will feature an easy, two-hour stroll along Waldrip Ridge, high above Monroe Lake's southwest shore just west of the State Road 446 Causeway. The destination is a late-19th-century homesite of the Joshua Waldrip family. The afternoon will feature a rigorous, three-mile trek on the Axsom Trail through the Charles C. Deam Wilderness on the lake's southeast shore. The loop trail begins and ends at the Hickory Ridge Firetower. This Hoosier National Ecotour is free and open to the public. Please contact Lori Adelson to register or for more information. - Time: 10:30 a.m. - 3 p.m. -- Carpool: From Scenic View Restaurant -- Be prepared for heat and mud. 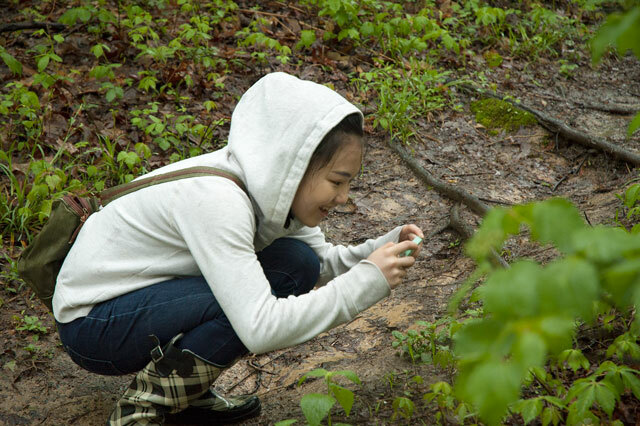 This ecotour is being planned in conjunction with the Bloomington Chapter of the American Council of the Blind and will feature stops at three natural areas in and around Bloomington: Beanblossom Bottoms Nature Preserve, Leonard Springs Nature Park and Latimer Woods. Beanblossom is owned and managed by Sycamore Land Trust. Leonard Springs and Latimer are City of Bloomington properties. The American Council of the Blind's mission is to "increase the independence, security, equality of opportunity, and quality of life, for all blind and visually-impaired people." This morning ecotour is not limited to Council members. Please contact Natural Bloomington for information. 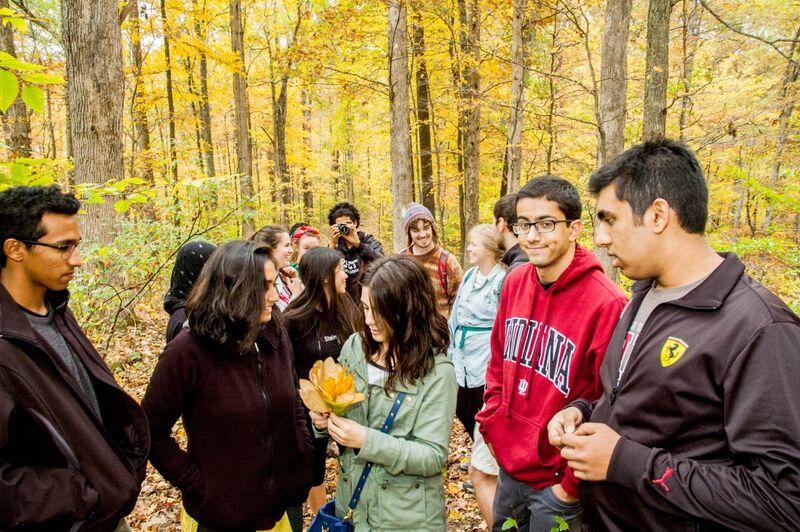 A multicultural group of college students from the IU Oxfam Club joined us for an afternoon trek along a stretch of the Tecumseh Trail in Yellowwood State Forest deep in Brown County. 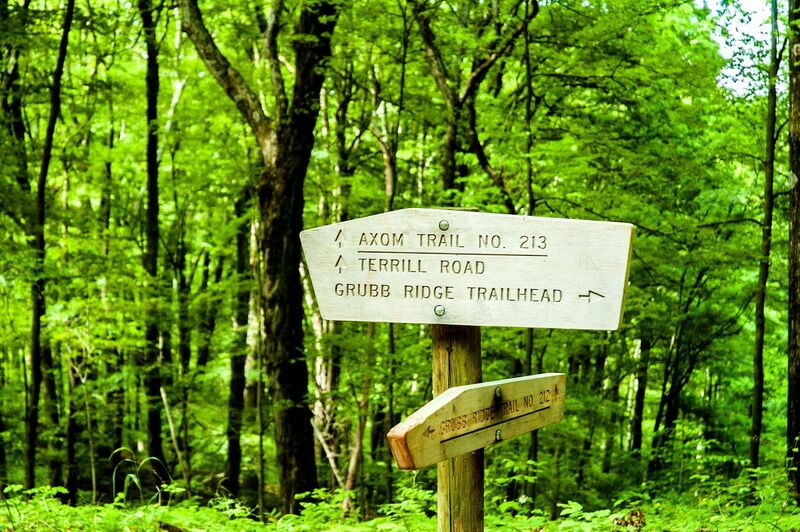 The 42-mile trail is Indiana's second longest and stretches from the Morgan-Monroe State Forest in southern Morgan County, through portions of Monroe and Brown County and Yellowwood and the Hoosier National Forest near Monroe Lake on Crooked Creek Road. This group of 15 started at the southernmost trail head on Crooked Creek Road and hiked a few miles in and out along a breathtaking ridge top. Brilliant fall colors and crisp weather made for an almost perfect ecotour. Click here for a Photo Album from the ecotour. A full bus load of folks from the Endwright Center in Ellettsville joined us for our second-year-runing Fall Color Ecotour. This year we were joined by Monroe County Naturalist Cathy Meyer, who provided binoculars for everyone who came along. (This one had a waiting list). 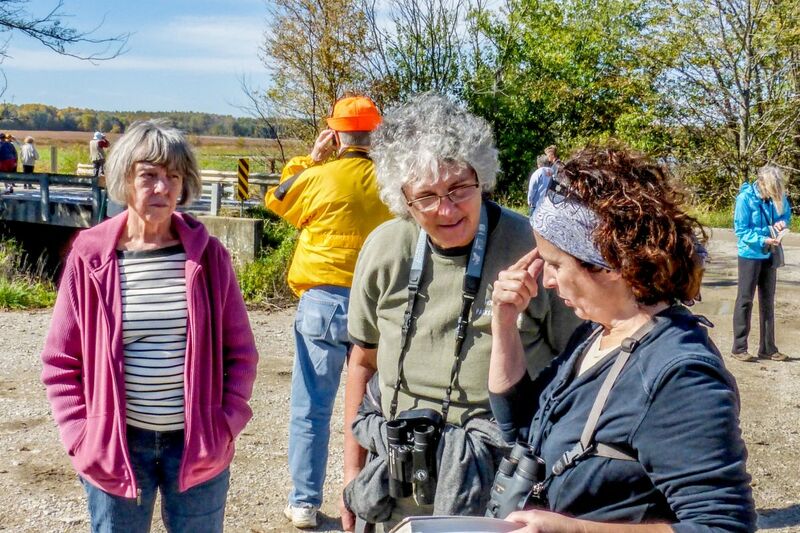 After picnicking among the fall colors at a shelter house in the Greene-Sullivan State Forest, the group put the binoculars to good use at the Goose Pond Fish & Wildlife Area, which has become Indiana's premier spot for bird watching. 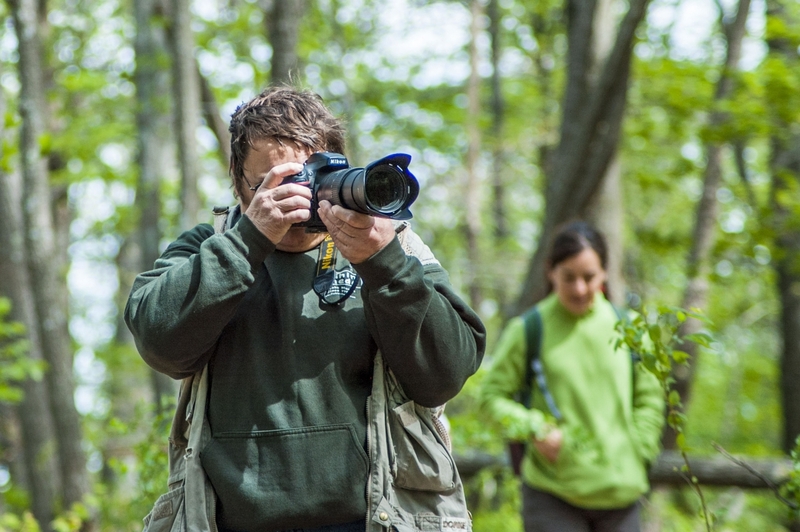 Pulitzer Prize winning photographer John Blair (photograph at right) was the featured guest on this Nature Photography Ecotour from Natural Bloomington. It was designed for those who are committed to the take-only-photographs aspect of ecotourism and offered instruction and guidance for guests with smart phone cameras and advanced SLR systems, digital or film. We rendezvoused on Bloomington's east side and carpooled to the T.C. Steele State Historic Site in Brown County, via the back roads on the banks of the North Fork of the Salt Creek, where John talked photography before exploring the grounds owned by world-famous impressionist painter T.C. Steele and his wife Selma, whose gardens were likewise world-renowned. We changed plans changed when we found the Crooked Creek State Recreation Area flooded and instead ascended a ridge top on the Tecumseh Trail in Yellowwood State Forest. Guests on this ecotour, held in conjunction with the Creative Aging Festival, explored the mostly-wooded watershed that surrounds Monroe Lake, Indiana's largest waterbody. Sponsorec by the City of Bloomington Commission on Aging, this annual festival "celebrates creativity and our aging population." This ecotour followed the Monroe watershed south and west from the its shallow, upper reaches, around the south end, to the dam. Stops included the Stillwater Marsh wildlife viewing platform, Pine Grove State Recreation Area, Hardin Ridge Recreation Area in the Hoosier National Forest, and the dam. Authors Ellen Sieber and Cheryl Munson -- Looking at History: Indiana's Hoosier National Forest Region, 1600 to 1950 -- accompanied us on this ecotour through the Hoosier and talk about the area's natural and human histories. 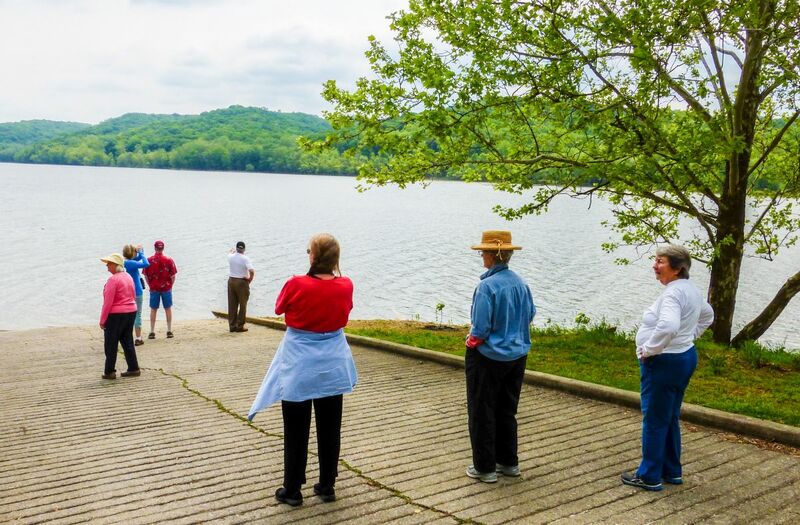 Ecotour guests met at the Cutright State Recreation Area on Lake Monroe and carpooled to the Waldrip Ridge overlooking the Salt Creek Valley, now Monroe Lake. We hiked through and explored the remnants of the late-18th century homesite of the Joshua Waldrip family, which includes an unrestored, 1877 cabin. Natural Bloomington does not charge for Ecotours or Guide Services but does ask for contributions to support our work. 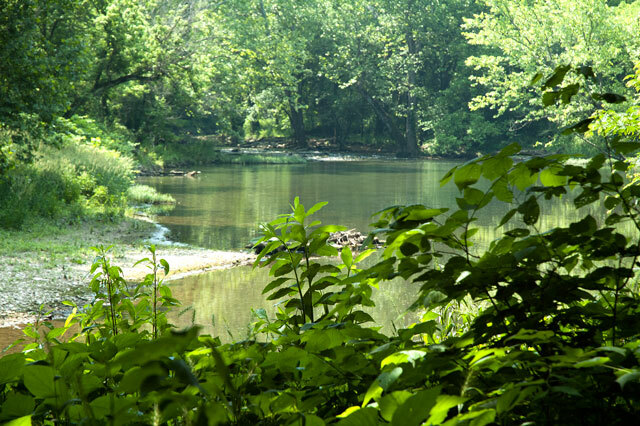 To arrange an Ecotour or discuss our Guide Services, please email us at info@NaturalBloomington.com. 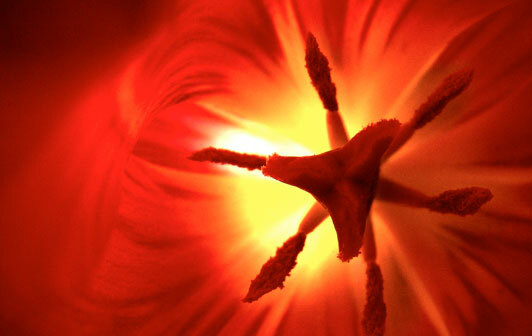 “For me, it is a great experience to get close enough to the beautiful nature of Bloomington. We spent some time visiting the Lake Monroe dam and climbing the fire tower in the Hoosier National Forest. This was the first time I got the chance to look down at the entire forest; the fog surrounded us, which was fascinating. Click here to read more testimonials and feedback from other Natural Bloomington ecotour guests.